It! 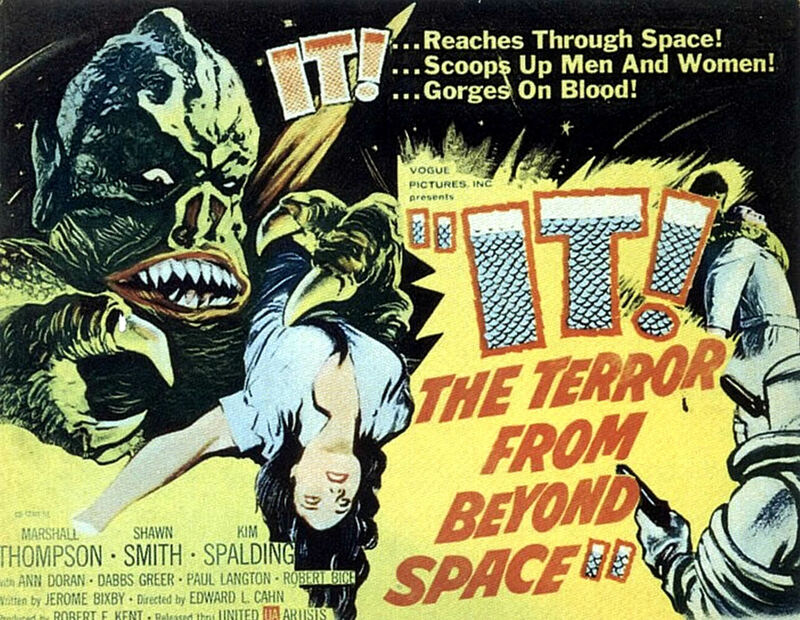 The Terror From Beyond Space (1958) is famous -- or perhaps, notorious -- these days mostly because some viewers and films scholars view it as a heavy influence on Ridley Scott’s landmark horror film: Alien (1979). It’s easy to see why people might make this particular case. In particular, both films involve hideous, hostile alien life-forms killing the crew-members of a space ship in flight. Both films involve scenes set in spaceship vent tubes too. Plus, both malevolent alien life-forms do nasty things to human bodies during their rampages. But what makes Alien endure as such a classic genre movie isn’t really the streamlined plot outline -- monster on a spaceship killing people! -- but rather the fashion that Scott so adroitly visualizes the tale. The Scott film imagines a lived-in world of blue collar astronauts, and puts that world in dynamic juxtaposition with a bio-mech alien life-form in a constant state of physical flux. We never know what the alien is going to “be” the next time the crew encounters it. The vastness of the Nostromo means that there are plenty of places for the nasty xenomorph to hide, too. And there is no escape possible, since the ship is alone in the vastness of space, light years from port. So there indeed exist commonalities in terms of narrative between It! The Terrror From Beyond Space (penned by the late Jerome Bixby) and Alien. But in terms of imagery and impact, Alien remains light years beyond the 1958 film. To put it bluntly, Alien is a masterpiece of the format, and It! is but an occasionally resourceful or inspired B movie. In fact, It! suffers greatly in 2016 because of its low-budget production design, general lack of meaningful characterization, and, finally, the director (Edward Cahn’s) visual selections. On the final front, the film features few close-ups, relying instead on master or long shots. This approach subtracts from the horror quotient, and diminishes the feeling of “isolation” or terror that should be (but isn’t…) generated. It! 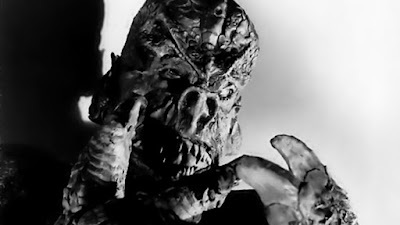 The Terror From Beyond Space is a lot of fun, and, of course, it deserves credit for scaring a generation of kids silly. 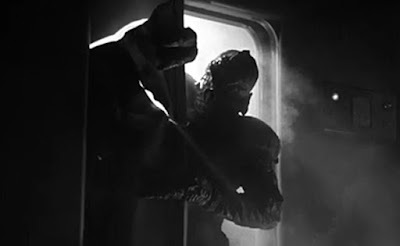 But the film also plays a bit like a low-rent version of a truly remarkable monster picture of the 1950s: the brilliant and (quite possibly immortal) Creature from the Black Lagoon (1954). The creature featured here, however, lacks the elegance and pathos of the Gill Man. Maybe someone should look at how that film influenced Alien? So today, It! 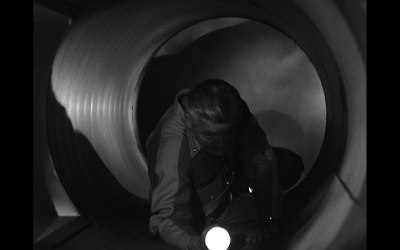 The Terror From Beyond Space plays as mostly a curiosity. It features moments of intrigue and horror, but more-than-half-a-century later many other films (and TV programs) have dramatized a similar story with more flair, color, and successful imagery. 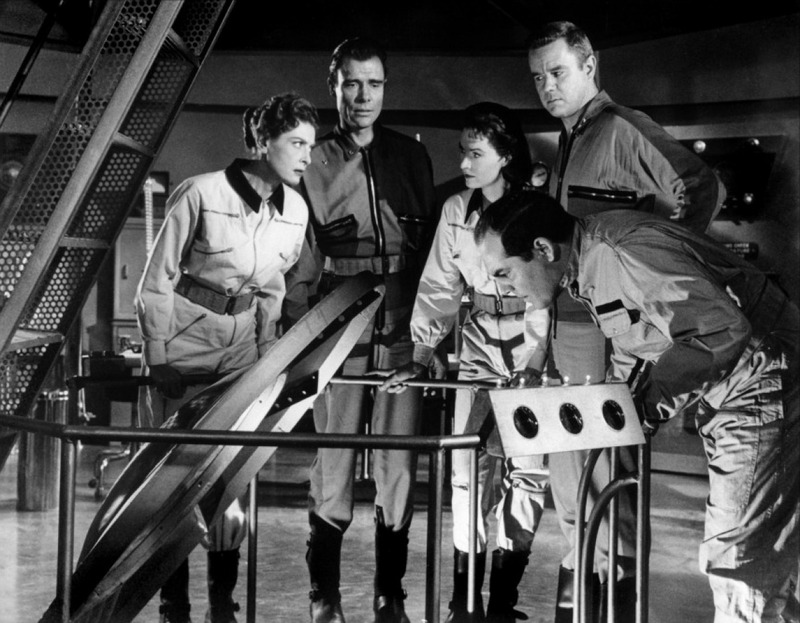 The futuristic year of 1973, Colonel Van Heusen (Kim Spalding) leads a rescue mission to the surface of Mars. There, an earlier ship, the Challenge 141 under command of Col. Edward Carruthers (Marshal Thompson) has suffered a terrible tragedy. All the crew members are dead, save Carruthers. They have been murdered. 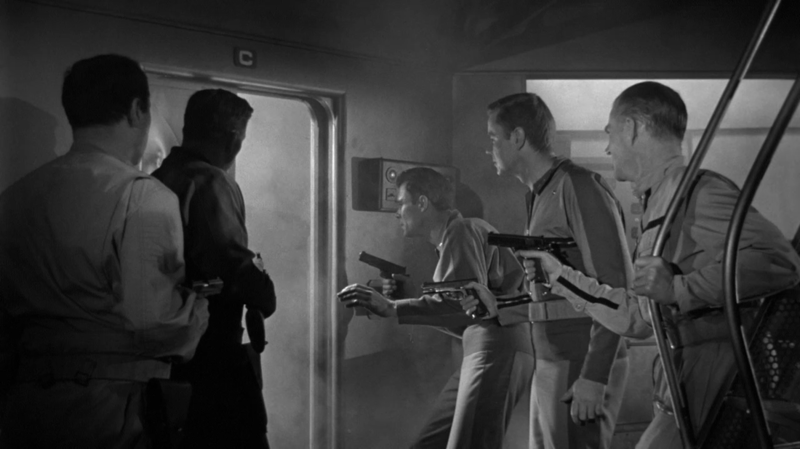 Carruthers is arrested for the crime, and Van Heusen suspects that he murdered his crew as a way of preserving supplies. By contrast, Carruthers insists that his crew members have all been killed by a monstrous alien being. Grenades, bullets and fire don’t stop the monster, and the crew soon learns that it is deriving sustenance from the men it kills, draining “every ounce of fluid”from their bodies. A desperate plan is launched to depressurize the ship and suffocate the creature. It! The Terror From Beyond Space clocks in at 69 minutes, and yet it ends not a moment too soon. Had it lasted any longer, viewers might very well begin to ask questions that the filmmakers would probably rather not answer. For example, how can grenades be detonated, and bullets fired willy-nilly on a spaceship in flight -- especially the one the size of a Challenge rocket -- without damaging the vehicle? Here, there is no problem at all using explosives and projectile weapons aboard what is apparently quite a small craft. And on the same deck as the power generator, to boot! The crew people wire grenades to a vent covering, for instance, without any worry that it might cause a hull rupture, or cause explosive decompression. The possibility of such a disaster is not even name-checked. With so many crucial ship’s systems and control panels around, the plan to fight the monster with grenades and guns might be a little reckless, no? A second question might involve the creature itself. How does it successfully stay hidden aboard a craft of this size for any length of time whatsoever? Basically, the inside of the rocket consists of just three “ringed” decks. Each deck or ring contains a large center room, with, apparently, a string of rooms on the outer ring that are only accessible form the center portion of the ring. The monster -- which is large and loud -- wouldn’t seem to have many places to hide here. While it’s true that the sequence involving a crew-member in a circular vent shaft does forecast Captain Dallas’ death scene in a similar locale in Alien, it’s important to clarify that this vent doesn’t apparently traverse the levels of the ship. It’s limited to one level, so the alien is, for much of the film, limited to one ring or deck, and not able to move back and forth between them. In other words, it’s contained there. Nobody suggests just decompressing that deck, or sealing it off till they reach Earth. Both seem like eminently logical solutions. The entire movie takes place on these rings or decks, which would seem an opportunity for a clever director to create and maintain an aura claustrophobia, but director Cahn instead shoots mostly from a distance, populating his shots with many characters, as they debate the crisis. The relative lack of close-ups not only makes it more difficult to identify with particular, individual crew-members, but lessens the impact of the terror. If all the crew-members -- ten or so -- stay together in the frame, there’s little opportunity to create a mood of terror or isolation, rather just a feeling of overcrowding. A movie like this depends on scenes with crew-members, by themselves, moving through dark corridors, not knowing what is around the next corner. It! 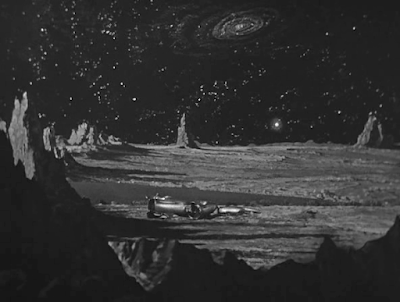 The Terror from Beyond Space doesn’t feature many scenes like that because of the rocket’s size and interior layout. I understand why It! The Terror From Beyond Space maintains a fan-base, for certain. 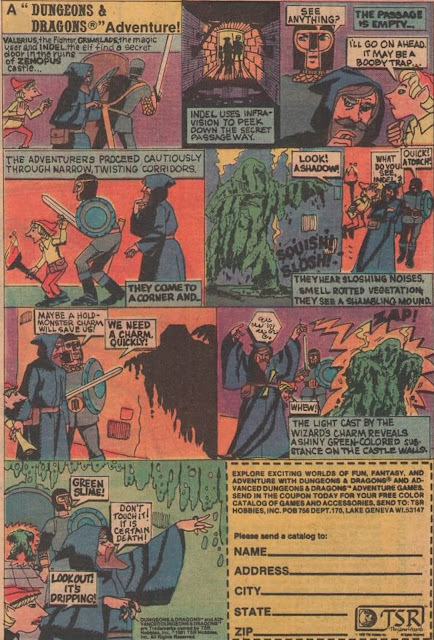 Some of the scenes of the monster skulking in the darkness, or in silhouette, remain effective. The monster loses some of its impact, however, when we see it in the light. Also, the notion of something damn-near unkillable ripping open deck flooring/hatches with its bare hands -- like sardine cans -- is one that is downright nightmarish. I also admire the fact that the film doesn’t go overboard with explanations or a back story. We don’t really know anything about the monster except what one scientist concludes. But it’s just a theory, and so the monster retains its mystery throughout the film. Oddly enough, I would say It! The Terror From Beyond Space may share more in common with Aliens (1986) than it does with Alien. Think about it: the survivor of a doomed expedition (Carruthers/Ripley) is rescued. Then, that character is suspected of wrong-doing, and illegality, until his/her story of an alien monster proves true. When I first went to see Alien, I immediately thought of this movie, so I guess I wasn't alone in making the connection. However, I remember seeing an Isaac Asimov interview where he likened Alien to being basically a monster chasing people around in a haunted house, so it's really a standard formula to create suspense and action. When I first saw It! in 1976, the movie was showing its age even then. My 11-year-old mind could pick up on many of the plot holes you pointed out, and I found it a bit dull. Watching it as an adult, I was able to look beyond the absurdities and accept it as 50's monster fun. I doubt that Dan O'Bannon and Ridley Scott were inspired by this movie so much, but rather influenced by it and the numerous other science fiction and horror films that used a similar formula. I thought of Alien, too, when I first saw this movie at the drive-in. I was about 11 or 12, and like Neal, I also caught a lot of plot holes. But, it was such a great time seeing it at a drive-in double feature (with The Blob) I ignored all the silliness and just loved it.